BERKELEY TOWNSHIP– Mayor Carmen F. Amato, Jr. is proud to announce that the Sounds of Summer Concert Series Will return to Veterans Park in Bayville this summer. “I am pleased to say that the return of our wildly popular “Sounds of Summer Concert Series” for 2019 is our 20th year,” Mayor Amato proclaimed. “Opening night will be Wednesday June 26th. Beginning at 6:00pm, we will feature long-time Jersey Shore talent, Rock N’ Rhythm; a five-part vocal group with a tight harmonious sound of both traditional Doo-Wop and contemporary styles, followed by headliner Garden State Radio, a pop and rock band playing hits from the 80’s, 90’s and today. This band will thrill the audience with the music from Pat Benatar to Katy Perry; from Michael Jackson to Journey and many more,” Mayor Amato said. “July 10th will be a night with two Headliners. Starting the evening at 6pm, we will feature Atlantic City Headliner Gerard Esposito, who will give you a Centennial Celebration of the music of the Chairman of the Board, Frank Sinatra along with the music of Paul Anka, Bobby Darin and more. The crowd will be entertained by the songs of these iconic figures. From Vegas to Broadway, Gerard can do it all. The second act of the evening will be the The Duprees, one of the all-time favorite golden oldies recording groups,” Mayor Amato added. 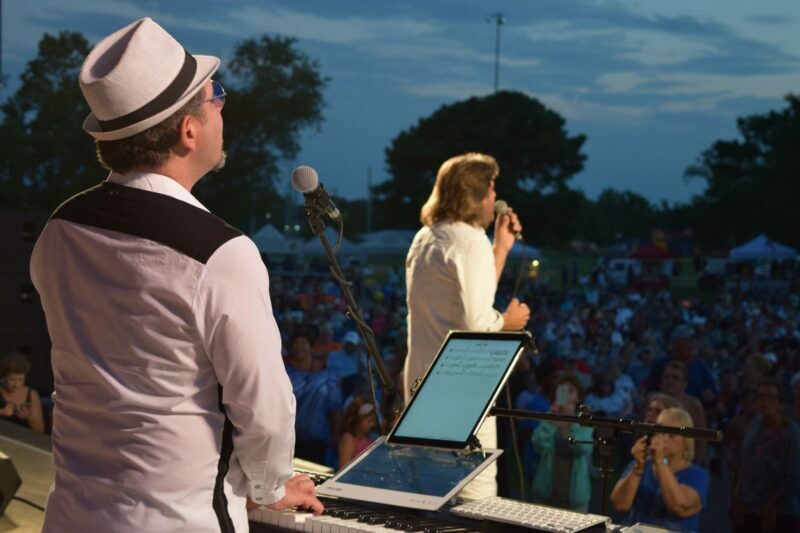 July 24th, beginning at 6pm, we will feature opening act, Sounds of the Street, a popular Doo-Wop group followed by Beginnings– The ultimate Chicago Tribute Band. “Their horn section and vocals will make you feel like you’re at an authentic Chicago concert as they play all the hits of this Rock n’ Roll Hall of Fame group,” Mayor Amato stated. July 31st, will be our Annual Beach Party at White Sands Beach in South Seaside Park at 23rd Avenue. From 5:30pm to 8:30pm Alotta Colada, keep your toes in the sand and enjoy a jamming island party band with great music, props and a lot of energy, will entertain crowds for the evening. August 7th, beginning at 5:30pm, will be our Eighth Annual “Night Out Against Crime.” Mayor Amato stated, “The Berkeley Township Police Department will be on hand along with our Township First Aid Squads, Township Fire Departments and other public safety agencies to greet residents and show the different types of equipment that they utilize. All of these public safety agencies will have their vehicles and equipment on display, as well. Our DARE Program will also be there with games and prizes for the children to enjoy.” The group performing at 7:30pm is The Infernos Band, America’s #1 Show Band and the area’s premier live performance group singing four decades of music. August 21st, will begin with Julian & Dominique. This dynamic duo will entertain the audience with a wide variety of music. Known as the show of 1,000 voices, you will delight to the sounds of Alicia Keys, Lady Gaga, Black Eyed Peas, Lady Antibellum, Michael Buble, Johnny Mathis, Barry White and many more. They will be followed by headlining group,“Wanted DOA” a Bon Jovi Tribute Band. This is the ultimate tribute to this Rock n’ Roll Hall of Fame band. The look and sound of this band will make you feel like you’re at an actual Bon Jovi concert. Our Summer Concert Series Finale will be on Saturday, September 7th – Berkeley Township Community Pride Day. Community Pride Day begins at 11 am with rides and inflatable’s for the kids. We will have many vendors, local non-profits and community groups. The late afternoon will begin our musical entertainment at 5:30pm with Jukebox Legends. Their vocals and show will take you back in time to the sounds of the 50’s and 60’s, followed by New Power Soul. This dynamic 9-piece band will entertain the crowd with their music and showmanship. From R&B, Classic Rock, 80’s to Top 40. From Queen to Bruno Mars. High Energy all the way!! After the show, we will have a fabulous fireworks display. As always, the cost of the summer entertainment is funded by community and business donations. These donations fund Berkeley Township’s entire Summer Concert Series, our Beach Party, Berkeley Township Community Pride Day and other summer events. The funds are raised through the Mayor’s golf outing, our summer program book and outdoor stage advertising. To download a Summer Advertising Packet or contact Berkeley Recreation at: 732-269-4456. The Annual Mayor’s Golf Outing, is scheduled for Thursday, June 6th. If you’re interested in being a sponsor or playing in the golf outing, you can contact Berkeley Recreation at: 732-269-4456. For more information, contact the Berkeley TownshipRecreation Department at 732-269-4456 or www.BTRec.org or find us on Facebook at www.facebook.com/Berkeley-Township.